The year 2016 marked the 150th anniversary of the publication of Fyodor M. Dostoevsky’s seminal novel, Crime and Punishment (1866). A revelation when it first appeared in Moscow on the pages of the journal Russian Messenger, it continues to provide readers unparalleled insight into the individual’s role and moral responsibility in society. Following the murderous aspirations of the novel’s protagonist, former student Raskolnikov, we are confronted with the struggle of reconciling rationalist action with the human conscience, and witness one of Russia’s greatest artists at the peak of his success. 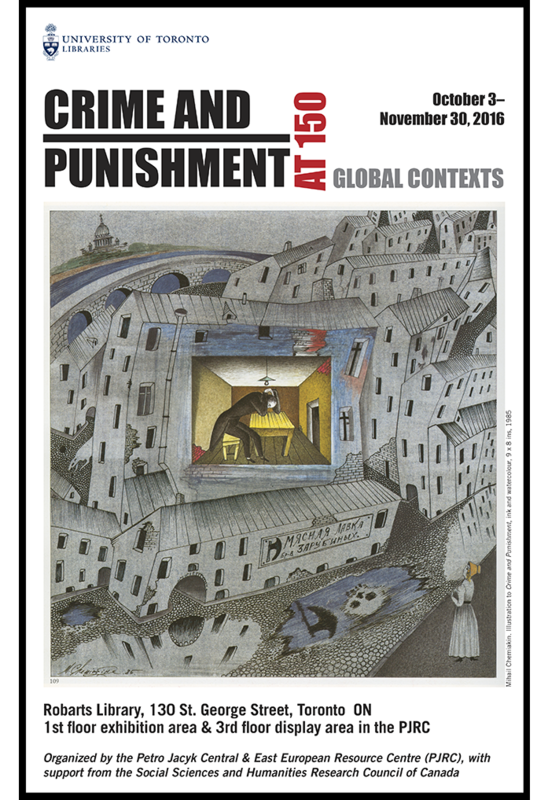 To commemorate Crime and Punishment’s resounding triumph and influence, a two month exhibition was held at John P. Robarts Research Library, University of Toronto, from October 3-November 30, 2016. Through the theme of “Global Contexts” it sought to celebrate the novel’s international reception and propagation, highlighting the rich variety of the collection held by the University of Toronto Libraries and the relevance of the holdings to interdisciplinary research and teaching. This online exhibition offers an interactive platform through which to engage with the materials showcased, and support the continuing study of the novel across the boundaries of nation, language, and media. Over twenty countries are represented, and each category of materials offers a different genre in which to appreciate the novel: translation; art and illustration; belles-lettres and popular fiction; film, stage, and music; and literary criticism. Each item symbolizes the interminable relevance of Dostoevsky’s work, and emphasizes key threads of his thought that hold special significance for the development of culture world-wide. 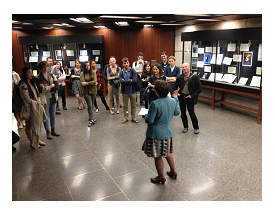 The Robarts Library exhibition formed part of a SSHRC funded outreach project, Crime and Punishment at 150. Sponsors include the Petro Jacyk Central & East European Resource Centre, and the Department of Slavic Languages and Literatures. The original exhibition was curated by Professor Kate Holland and Ph.D. candidate Barnabas Kirk. This online platform was developed by Barnabas Kirk in conjunction with University of Toronto Libraries.